Abandoned buildings have become such a common sight that they often slip quietly into the backdrop of our cities like an accepted part of our landscape. 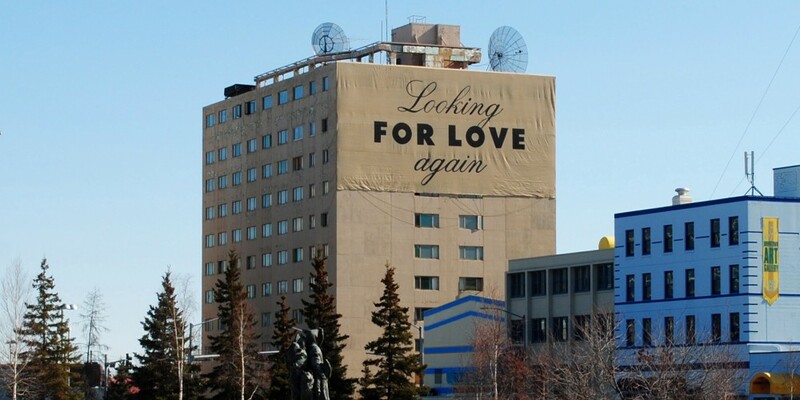 Looking for Love Again is a participatory public installation that renews attention to an abandoned high-rise in downtown Fairbanks, Alaska to celebrate its past and future. 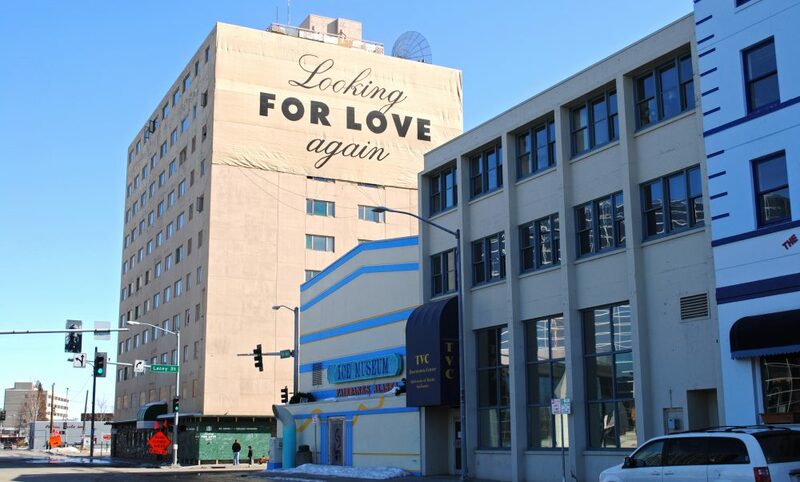 Chang draped a four-story sign on the Polaris Building that said “Looking for love again” to transform it into an emotional beacon pleading for love and inviting people to come in for a closer look. 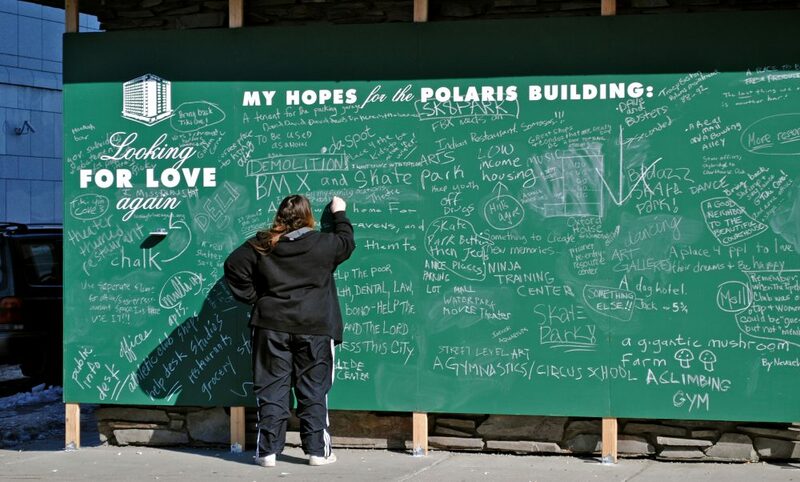 Chalkboards at the street level, as well as an accompanying website, invited people to share their memories of the building and their hopes for its future. 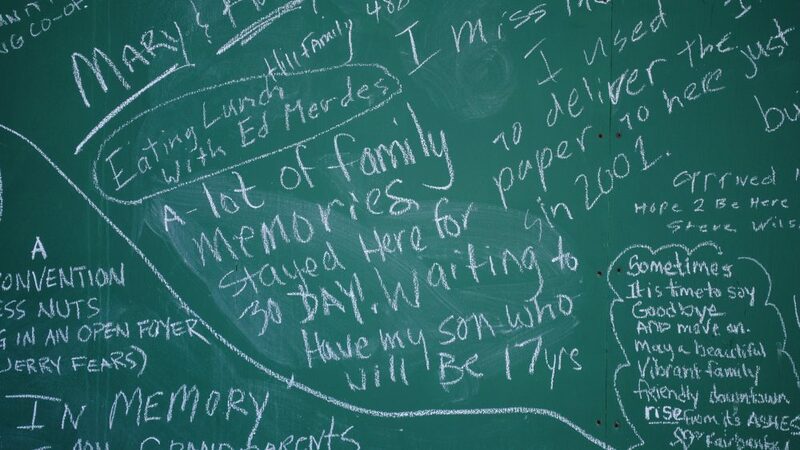 Written memories included good times in the Tiki bar on the top floor, families’ first apartments in the complex, and a common ghost story during its abandoned years. 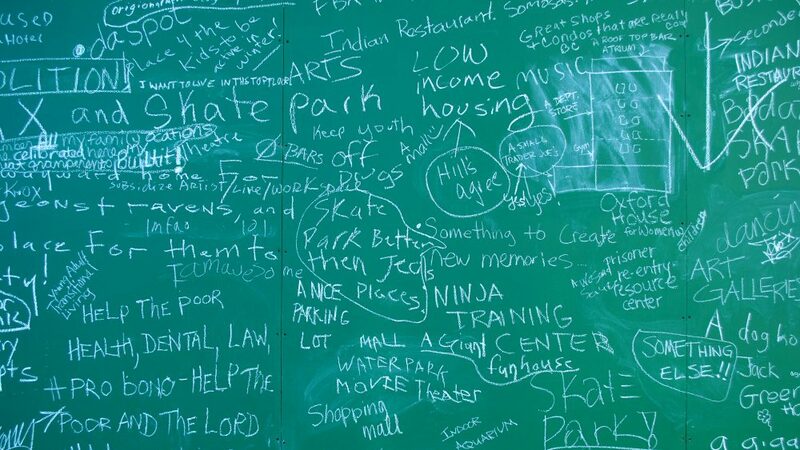 Hopes included a grocery, an Indian restaurant, a ninja training center, and modern apartments. 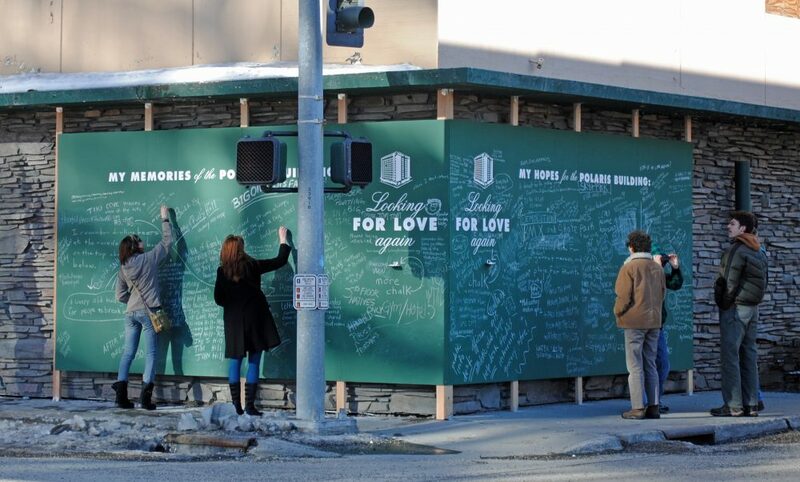 Commissioned by the Alaska Design Forum, feedback from the project was used by the developer and the downtown association to inform next steps. 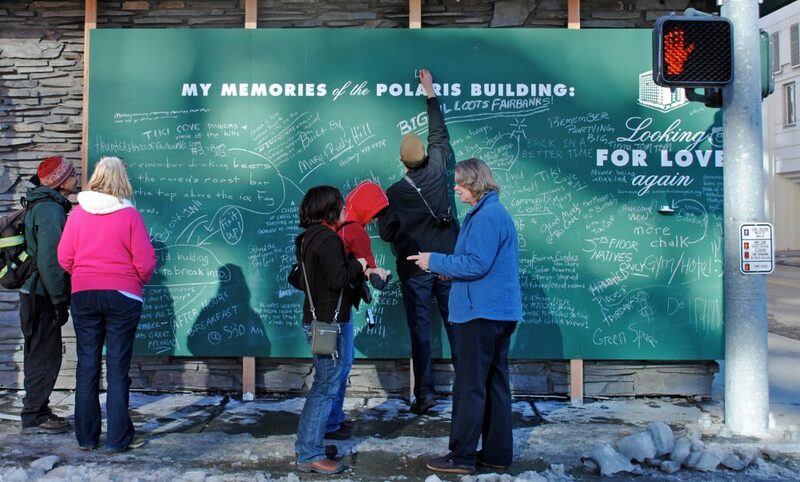 By drawing emotional attention to the neglected building and providing residents with a platform to share, the project explores the impact that buildings have on our lives and how they can become meaningful again. 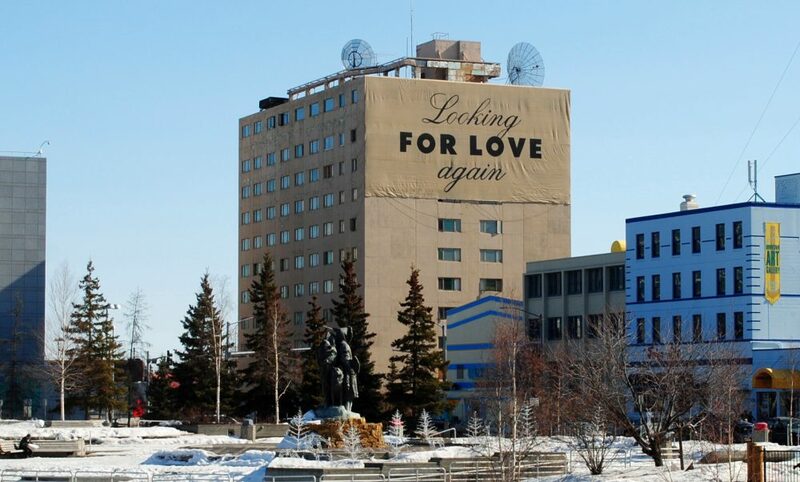 2011, Fairbanks, AK. Acrylic on industrial fabric, chalkboards, wood, spray paint, chalk, abandoned high-rise. 68’ x 36′ sign, 30’ x 10’ chalkboards. Project coordination by David Hayden. Project assistance by Mike Hondel. Installation assistance by Bernie Baecker, Carol Hayden, Sean Hering, Kate Incarnato, Galen Lott, Dustin Miller, Jessica Nelson, Amy Nordrum, Ian Oleson, Sheri Oleson, Pat Rivera, Jack Schmid, Trent Schoenemann, Sue Sprinkle, Dave van den Berg, and Jared van deer Weele.